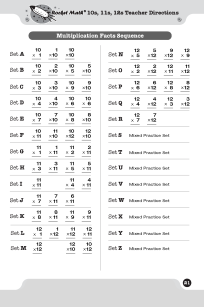 The same Rocket Math process, worksheets, routines but teaching the 10s, 11s, and 12s division facts, e.g., 7 divided into 70, 11 divided into 44, 6 divided into 72. 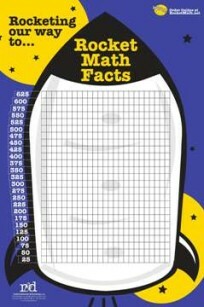 For those students who have mastered the 10s, 11s, 12s Multiplication facts AND the 1s through 9s Rocket Math division facts. 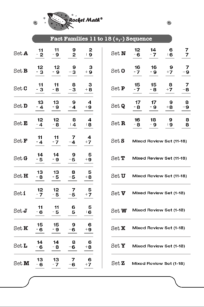 Includes cumulative review of the 1s – 9s division facts while gradually introducing and teaching the 10s, 11s, and 12s facts. Lots of good review of ALL the facts as can be seen in Set W to the left. 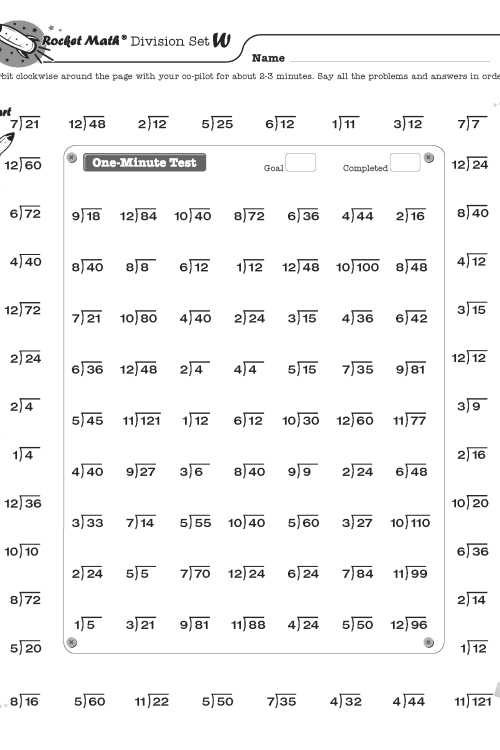 The same Rocket Math process, worksheets, routines but teaching the 10s, 11s, and 12s division facts, e.g., 7 divided into 70, 11 divided into 44, 6 divided into 72. For those students who have mastered the 10s, 11s, 12s Multiplication facts AND the 1s through 9s Rocket Math division facts. Includes cumulative review of the 1s – 9s division facts while gradually introducing and teaching the 10s, 11s, and 12s facts. Dictating Sentences is spelling with a twist. 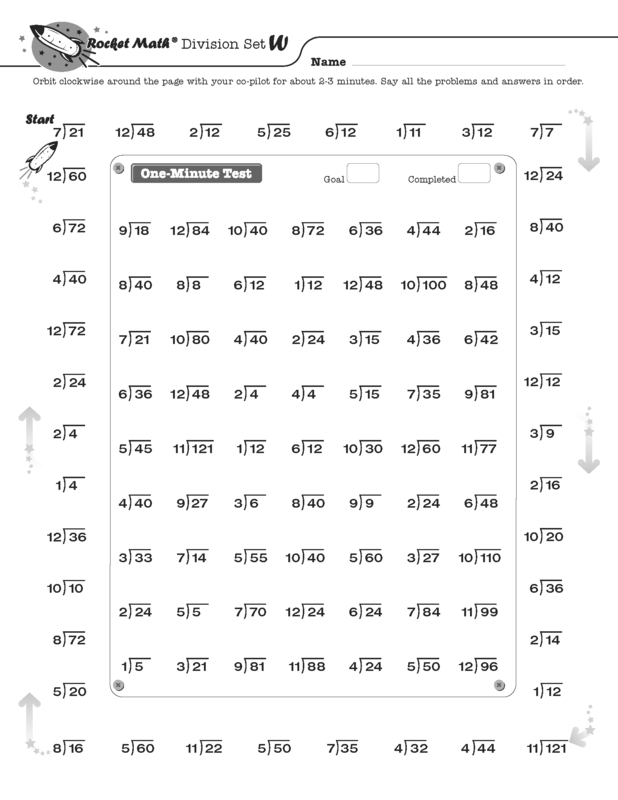 Instead of spelling one word at a time, in Dictating Sentences (now part of the Universal Level Rocket Math Worksheet Program) students are asked to write an entire sentence from memory. They work in pairs and their tutor has the student repeat the sentence until it is learned. Then the student has to write the whole sentence from memory. It turns out this is considerably harder than writing words on a spelling test, so it is challenging practice, and does a lot to help students develop automaticity with spelling. If you have to stop and think of the spelling of a word while you are trying to write, it distracts you from thinking about what you are trying to write. Students are more successful and better able to show what they know and better able to focus on learning when their tool skills have developed to the level of automaticity. Daily practice develops automaticity. Developing automaticity with math facts and with spelling requires a lot of practice. Daily practice is best and a few minutes a day is optimal. That is why Rocket Math is designed the way it is–to provide that daily practice. So Dictating Sentences gives each member of the pair ten minutes a day of practice writing sentences composed of words they know how to spell. Working in pairs. As you know from Rocket Math practice, students enjoy working in pairs. And when one partner has an answer key the practice can be checked and corrected. Sound research shows that immediate correction and editing of misspelled words is the fastest way to learn the correct spelling, so that’s what we have the student tutor do. After each sentence is written every word is checked and practiced again until it is correct. Mastery learning. The program is structure so that all the words are learned to the level of automaticy. Students keep working on a sentence until it can be written without any errors. They work on the same lesson for as many days as is needed for them to spelling every word perfectly in all three sentences. 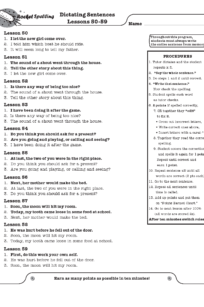 Each sentence persists for two or three lessons, so that the student is required to write it from memory and spell every word perfectly for several days in a row. 500 Most common words. Dictating sentences systematically practices the 500 most common words that students need in their writing. It includes all of Rebecca Sitton’s 400 Core Words. It also includes the 340 words that children most need for writing according to writing researchers Harris and Graham. When students know these words to the level of automaticity, they will be able to write fluently and easily. Earning points by being correct and going fast. Students earn two points for every word that is spelling correctly the first time. Every word on which there is an error is worked on until it too can be spelled correctly, earning one point. The faster students go during their ten minutes, the more points they can earn. Students graph the amount of points earned and try to beat their own score from previous days. Teams can be set up and competition for the glory of being on the winning team can enhance the motivation. Individual Placement. There is a placement test. Students begin at the level where they first make a mistake. Student partners do not need to be at the same level, so every student can be individually placed at the level of success. A number of math programs around the country introduce math facts in families. Now Rocket Math does too! Learning math facts in families, is gaining in popularity these days. Logic suggests that this would be an easier way to learn. However, the research is not definitive that this is easier or a faster way to learn facts than separating the operations and learning all addition facts first and then learning all subtraction facts. But learning in fact families is a viable option, and I wanted to have it available for Rocket Math customers. Part Two is a Best fit for second grade. These facts come after the facts in 1 to 10, typically learned in first grade, so these are best for second grade. 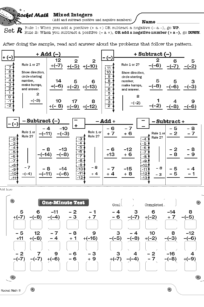 The 25 fact families in 1s through 10s facts are just enough for one Rocket Math program. It is a good and sufficient accomplishment for first grade. With the 11 to 18 in Par Two for second grade there will be a lot of review. In fact sets S through Z are all review. I have heard that some first grades prefer to keep the numbers small but to learn both addition and subtraction–so this program accomplishes that. I added Fact Families Part Two 11 to 18 (+, -) to the Universal subscription in August of 2018 bringing the total number of programs in the Universal subscription to 19 (the basic four operations and 15 more!). As always, new programs are added to the Universal subscription without additional cost as soon as they are available. I most sincerely want students to be successful and to enjoy (as much as possible) the necessary chore of learning math facts to automaticity. Please give me feedback when you use this new program, Fact Families 11 to 18 (+, -), as to how it goes for the students. Mixed Integers displays problems on a vertical number line and then teaches students two rules about how to solve problems that add or subtract positive and negative numbers. Rule 1: When you add a positive number OR subtract a negative number, go UP. Rule 2: When you subtract a positive number OR add a negative number, go DOWN. Students learn how these rules play out when starting with a positive number and a negative number, gradually learn these two variations of all four types of problems. They learn to solve a problem type using the number line and then to recognize the pattern of each problem type by working several examples of each type. This practice gives them a chance to build fluency with each problem type as they work with their partner on the top half of the page. You will probably not be surprised that there is a one-minute test on each set. The goals are slightly different than before. Students are to be 100% accurate and to meet or beat their goal from the special writing speed test for mixed integers. 8 online lessons teach students how each type of problem is solved and why it is correct. A set of 1 dozen 24″ x 36″ Rocket Math Wall Charts and 12 sets of star stickers, directions and Goal Arrows that can be used to recognize student progress and produce high levels of motivation in your students. A $216 value.